It’s not often I manage to sample our own events, but on Tuesday I was lucky enough to be invited by a member of The Queens Club to attend the second day of The Aegon Championships. I have to say that I found the whole experience brilliant. Before arriving I was told by my member friend to make sure my wristband was loose. So when the young girl was fixing my band on, I said that I was told to keep it lose. She smiled and said she wasn’t supposed to know that, and we both chuckled and off I went with my wrist having no circulation! Unfortunately I couldn’t make it for a lesson with the World Championship of Real Tennis so had to make do watching a few people play this sport that is the original indoor racket sport from which tennis descended…didn’t know that until I just looked it up!! I will have to make do with cycling around the Orchards for my current exercise. Anyway there was eleven of us who had a fabulous lunch accompanied by some wonderful Pimms and wine. When Murray came on, it was our cue to leave the corporate comfort of our dining facility at Queen’s and watch the game. Well. I had a spot no less than 10 feet away from Mr Murray. Has anybody noticed he has a cracking birthmark…anyone writing in can ask where! I have to say that is has been a while since I have been at The Aegon Championships at Queen’s Club, formerly The Stella Artois. A big difference with The Aegon corporate blue as opposed to the bright red of Stella but I did find the whole day superbly run, slick, smaller than Wimbledon, but arguably more personal. I could never have got that close to Mr Murray. 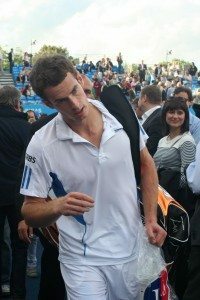 So anybody thinking about attending The Aegon Championships at Queens for 2011, GO! Even when it was raining, this was really no problem, conversation indoors never stopped!! Thanks for the ride back Peter, groovy car!